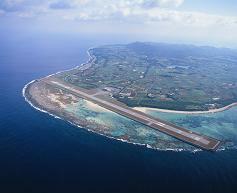 The construction of Kumejima airport was funded by the USCAR (United States Civil Administration of the Ryukyu Islands) and was completed in July 1963. Private companies began services in January 1965. The runway was improved and services with YS11 aircraft began in December 1968. Repairs to the airport began in 1972 in order to comply with Aviation law standards. Services were resumed with a 1,200m runway in April 1977. In response to passenger demand to increase aircraft capacity, the airport was upgraded to a jet airport with a 2,000m runway and resumed service in July 1997. Operation of civil aviation started.